By popular demand we are introducing a second class in 2012, the pulse84. We have created a cheaper race kit, smaller brakes, different exhaust and engine kit aimed at the less powerful smart fortwo. The reason for this, there are many owners of pulse 84 cars that have expressed an interest in converting their road car so they can come and compete. All the cars whether built by us or yourself will be eligible for the 4two cup, as long as they meet all the race regulations issued by the race series. The race series last year proved that someone with great car control and talent will shine, and what a place to shine…In front of high budget and high profile teams competing in Britcar. Most if not all the cars will be fitted with on board cameras. This can be used as a basis of evidence if any issues arise of bad, careless or reckless driving and behaviour on and off track. The aim for 2012 is ta make the 4two cup a respected race series and again make improvements and upgrades to the cars where necessary. In 2011 the 4two cup started with 10 cars. For 2012 we have the original 10 cars, plus 6 more being built at present. 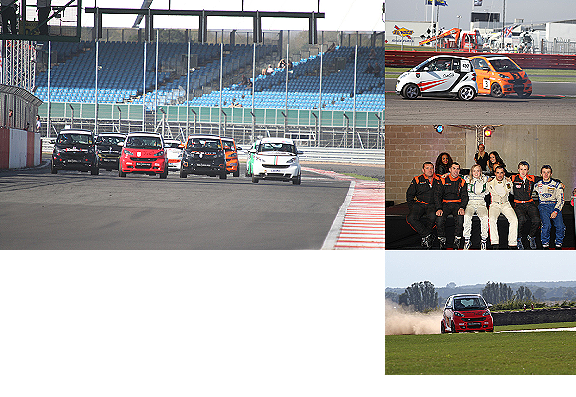 The aim is to have over 20 UK cars on the grid by the end of 2012 with over 30 cars racing in the 4two cup on the Britcar package for 2013. The series is backed by the smart club, smart racing club and official smart online media channels and websites, which should hopefully help the drivers find valuable sponsorship. We are currently talking to potential sponsors to allow us to create a free to air package which will be made available to TV stations channels such as Motors TV, Sky sports and other satellite and online TV stations.